Modern Korean politics has developed in the midst of great turbulence. In the first half of the twentieth century, Korea experienced Japanese colonial rule, liberation, national division, and civil war. Since then, Korean politics has been dominated by repressive dictatorships and widespread civil uprisings. The transition to democracy has been long and arduous. This volume, Korean Politics: Striving for Democracy and Unification, offers a critical view of the contemporary political arena by presenting a range of enduring historical factors that continue to influence Korean politics, and considers their implications for the future. Under the guidance of Prof. Kang Jung In, the 28 articles contained in this volume were selected from a total of over 300 published in the Korea Journal over the past 40 years and are arranged under five major themes. The nine articles in Part I cover the evolution of diverse political institutions in Korea, including the political party system, presidential and National Assembly elections, the bureaucracy, and local-level governments along with an overall assessment of democratization in Korea. The growth of civil society and social movements in the midst of Korea's democratization is the focus of Part II. This section discusses the Korean state as it is based on the concept of state autonomy, the strengths and weaknesses of civil society, and the role of the public sphere—especially the media—in the process of democratic transition and consolidation. 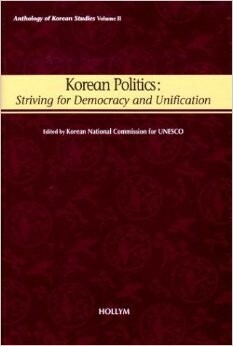 Part III introduces political culture and discourses of reform, examining such issues as the authoritarianism that dominated Korea's political processes, the continuing influence of Confucianism on political reform, and how popular conceptions of politics have changed during the transition to democracy. In dealing with North-South relations, Part IV presents a range of opinions on how to improve inter-Korean relations and establish a lasting peace structure on the Korean peninsula. The articles specifically focus on unification dialogue between the Koreas, confidence-building and disarmament, the relevance of the German model of unification for Korea and the North-South summit in 2000. Finally, Part V explores the international relations and strategic considerations surrounding the Korean peninsula, and considers the implications of international relations for Korean unification. Considering the enormous impact of U.S. policy on Korea over the past 50 years, this section pays particular attention to the origins and development of U.S.-Korea relations and the impact of U.S. policy on Korea's political future. In approaching Korea's complex political past and its uncertain future, this volume presents issues that have significance not just for students and scholars of politics, but for anyone interested in how Korea has been transformed in the last century, where it is headed, and what impact it has in the arena of international relations. Weiterführende Links zu "Korean Politics"
Unser Kommentar zu "Korean Politics"